Japanese police have arrested a former head of Mitsubishi Motors and five other executives as part of a probe into the death of a truck driver. 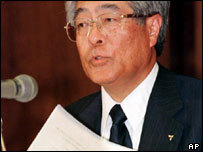 Former president Katsuhiko Kawasoe, 67, and his former colleagues are accused of professional negligence. Mr Kawasoe resigned in 2000 after the company admitted it had covered up and fixed vehicle faults rather than report them to the transport ministry. The firm said it would cooperate fully with the accident investigation. The company has been hit hard by the scandal that has dented sales and led to the recall of more than one million vehicles during the past four years. Mitsubishi last month negotiated a 450bn yen ($4.1bn) rescue package with Japanese and US investors and is keen to draw a line under its troubled past. Mitsubishi's problems came to light in 2000 after a cache of complaints was found hidden in a company locker room by government inspectors. Among the problems that were being reported and ignored were failing brakes, fuel leaks and malfunctioning clutches. The truck at the centre of the current investigation was made by the company that is now called Mitsubishi Fuso Truck and Bus. According to the Kyodo news agency, police believe that the fatal accident could have been avoided if the company had openly recalled the vehicles. Police spokesman Hiroyoshi Ichikawa is quoted as saying that in 1996 Mitsubishi "set up an internal committee and found out that there was a problem in the design and the production of the clutch housing". According to Mr Hiroyoshi, the committee concluded that it was necessary to recall the vehicle but decided to carry out repairs instead. The driver of the truck was killed after the clutch failed and the vehicle hit a wall. A Mitsubishi Fuso truck was also involved in the accident that killed a woman in 2002 when she was hit by a loose wheel. A number of Mitsubishi executives were indicted last month as part of that investigation, including former Mitsubishi vice-president Takashi Usami who was among those arrested on Thursday. The company had initially blamed improper maintenance. It now admits that a design defect in the wheel hub was to blame and has recalled 112,000 trucks in Japan. Mitsubishi said it would cooperate fully with the current investigation and offered its "sincerest apologies to the bereaved family".